You are viewing the archived 2015 ratings for broadband providers. Go to the current broadband ratings. Canstar Blue research finalised in February 2015, published in March 2015. Reviewed by the Canstar Blue Research Committee for publication on the 12th of March, 2015 . Westnet has swept its first award in our broadband providers category, securing five stars in the key area of overall customer satisfaction for 2015. Westnet stood out from a relatively large playing field, which included both Internode and iiNet – four star recipients in these results – and Optus, TPG, iPrimus, Telstra and Dodo, all of which achieved three stars. In an impressive sweep, Westnet scored five stars in all the rated criteria, which consisted of value for money, after sales support, connection speeds, reliability and billing. Additionally, Internode took out a top rating for billing in these results. Home broadband has become almost as indispensible a utility as water or electricity. However, the process of researching and changing broadband plans is often difficult and labour intensive.A whopping 45% of Aussies who responded to this survey thought that they could get a better broadband deal from another provider, and 38% have been shopping around over the past year to find a better deal. The good news is that with the number of ISPs in the market increasing every year (and competition increasing as a result! ), there’s never been a better time to find yourself a great home internet plan in Australia. We’ve commissioned customer satisfaction surveys of Aussie broadband customers for roughly half a decade; with the aim being to help you decide which company can give you a great deal. And these results don’t just look at overall satisfaction. Which broadband providers are best in show for ‘value for money’? The average Australian spends approximately $69.19 on their broadband plan every month, our survey results show. We were curious as to what that amount of money would buy you in terms of the products available from our rated brands. So, give or take $10, and keeping in mind that terms and conditions will always apply for these kinds of products, here’s what we found. Please note: Information published in the table above was current at time of publication. It would seem that all the providers offer something similar, with only minor variances between them. While it’s important to consider the above, we believe that value for money is a better barometer for assessing how valuable a product is than pure cost. Value for money essentially means great service and features at a price you think is reasonable – not just the cheapest price around! In the value stakes, the majority of our surveyed providers achieved high scores; Westnet came out on top and was followed by Internode, iiNet, Optus, TPG and Dodo, all of which achieved four stars each. Next were iPrimus and Telstra, who both achieved three-star ratings. It seems if you’re looking for a good deal in home broadband, you’ve got a lot of places to look! The scores achieved for technical support were more varied, with Westnet taking five stars and only two companies achieving four: iiNet and Internode. Behind these three were Optus, TPG, iPrimus, Telstra and Dodo with three stars apiece. One of the biggest bugbears for internet users is slow connection speeds; thankfully, the providers in our survey achieved good scores for customer satisfaction in this criterion. Westnet topped the charts with a five-star rating, and they were closely followed by four-star recipients Internode, iiNet, Optus and Telstra. Behind these on three-star ratings were iPrimus, TPG and Dodo. We found that the reliability of broadband services was the key driver of customer satisfaction in these results, meaning it’s a key selling point for brands that perform well in this category. 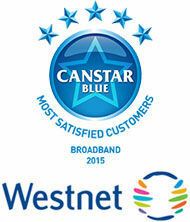 Westnet again the only five star recipient, and just two other providers achieving four– Internode and iiNet. The remaining companies – Optus, TPG, iPrimus, Telstra and Dodo – scored three stars. Satisfaction with ISP billing was the only area in which we had joint five star achievers: both Westnet and Internode scored five stars for billing satisfaction, followed by iiNet on four and rounded out by Optus, TPG, iPrimus, Telstra and Dodo with three. Canstar Blue commissions Colmar Brunton to regularly survey 3,000 Australian consumers across a range of categories to measure and track customer satisfaction. The outcomes reported are the results from customers within the survey group who currently have a broadband account in their name and pay the bills for it – in this case, 2,198 Australians. It was once considered a luxury and now, it’s something we rely on in our everyday lives. Deciding on a broadband plan really comes down to how much you are willing to pay. Our survey results show the average Australian spends approximately $69.19 on their broadband plan every month. Basic broadband plans can range from as little as $20 a month to more than $100. You can expect to pay more for a connection that is faster and has more data, as opposed to a slower connection with less data. The connection is essentially how the Internet is delivered to your home. In Australia, major Internet service providers use three main types of broadband connections including ADSL, Cable and Fibre. To read more on what each of these systems entail, we explain the 3 types of broadband available in Australia and the main advantages. Each Internet plan will have ranging downloading and uploading speeds. Downloading is when the data is transmitted from the Internet to your device (ie. downloading music). Uploading is when you transfer data from your device to the Internet (ie. uploading a photo album to Facebook). Not sure which speed is right for you? Read our NBN speeds explained to find out the differences in each speed tier and the best uses for them. The download allowance (‘usage allowance’, ‘data quota’, ‘download quota’) is the total amount of data you can upload and download. It is usually described in megabytes (MBs) or in gigabytes (GBs). Everything you do on the Internet, whether it’s searching for an item on google or browsing an online shop, results in you downloading and uploading a certain amount of data. This allowance will differ between Internet connection plans so you will need to decide how large an allowance you’ll need to fulfil your monthly Internet usage. Are you a light user, medium user or heavy user? Light users (500MB – 1GB): Uses the Internet occasionally to check emails, browse the Internet and download music. Medium users (3GB-15GB): Uses the Internet regularly to check emails, browse the Internet, online banking, online shopping, social networking and downloading music and video files. Heavy users (15GB+): Uses the Internet daily to research online, download music and movies, checking email and online banking. So you’ve chosen the Internet plan you want and you’re happy with the monthly cost, but have you considered the cost involved if you exceed the monthly data allowance? While limits are becoming less common for fixed line connections, many wireless plans may include an excess usage charge. This means you are charged on top of your usual monthly bill for going over your data limit. Make sure you ask about these charges. Fortunately, you’ll find a lot of plans now using what’s called ‘shaping.’ This means after you have exceeded your initial allowance, you aren’t charged any more fees. The catch? Once you have exceeded your initial data allowance, your connection speed slows down. You can buy a broadband plan in a bundle, which can include your home phone and/or cable TV. By keeping all of your services with one provider can lead to significant savings on your monthly fee. If you consider yourself a bit of a cybernaut (a.k.a heavy Internet user), you’re going to benefit more by having a faster plan with more data. We’ve compared Australia’s top NBN plans, where you can find out which provider is rated the highest and a detailed comparison on the plans offered. Can’t figure out which Internet connection suits you best? Let us help you decide. Know about the various types of broadband connections out there and how they work. ADSL (with ADSL2+ being the newest standard) is currently the most popular type of broadband in Australia. Available in most areas, the ADSL broadband uses telephone lines to provide broadband access to your home. Its technology allows faster download and upload speeds compared to the original dialup method. Using a device called a DSL filter, this is how the telephone voice signals are separated from the digital data and allows them to share the same line. Telcos such as Telstra and Optus already have thousands of kilometres of copper phone lines in the ground, so all they need to do is install the DSL filter. This makes ADSL a much cheaper option for customers. However, the downside to ADSL is the top speeds are much slower than cable or fibre connections. We listed the customers’ top ADSL broadband brands, and Internode was found to be the best provider among 7 other companies in terms of overall satisfaction. The price range of service packages will depend on the bulk of your monthly usage, ranging from $30 to $80, at 50 to 1000 GB. Some providers can even offer up to 2 TB. This connection allows Internet access near the quality of ADSL, without needing to pay for a home phone. Over the years, people have ditched their landline phones and resorted to cheap mobile plans. As a result, people assume this means they have to go wireless for the Internet as well. This is essentially what Naked DSL offers you, a product that only carries a data signal without a phone signal. The technical term for ‘cable’ Internet is hybrid fibre-coaxial (HFC). Essentially, it’s a hybrid network of extremely fast fibre optic cable and slower coaxial cables. This co-ax material increases bandwidth limits which means higher speeds and a broader capacity to bundle Internet with PAY TV and VoIP services simultaneously without interference. Australia is fortunate to have a gradual rollout of NBN access. It’s a data network that allows for stable information access, wherever you may be. With the Satellite Plan, all you’ll need is a modem and a computer and you’ll be on your way to having reliable data usage. This is particularly beneficial for users in remote or rural areas, with limited options of Internet service providers. Mobile Internet access is a favourite especially among Aussies on the go (i.e. accessing their information via smartphones or tablets). With the prevalence of 4G access, it wouldn’t be a surprise if wireless and mobile data access are eventually on par with Fibre or Satellite based broadband connections. Your choice of broadband connection depends on your budget and data needs, particularly whether information will be accessed at home or in the office. Find more information on the types of broadband available in Australia . See also our broadband buying guide. The National Broadband Network (NBN) is in the process of being rolled out across Australia. Think of the NBN as your ticket to high-speed Internet heaven. Unfortunately with the rollout still progressing, your location may not have access to this new technology just yet. So before you consider an NBN connection, you need to check whether your area has NBN access. It does? Nice! Let’s investigate how fast broadband will benefit you. Working from home will become easier with the same reliable and fast Internet connection you experience at work. Staying in touch with loved ones or work colleagues becomes a lot easier over skype and other online face to face contact. Everyone at home can be online at the same time- across multiple devices- enjoying the high speed. Access videos, entertainment on demand, online games, music, international TV, news and sport easily on every connected device in your home. For anyone studying, faster Internet extends the learning landscape beyond classrooms and lecture halls. Read more detailed information on how the NBN network will benefit you at home and the benefits for businesses. Whether you’re looking to purchase a new broadband plan or upgrading your existing one, it can be quite confusing to know which one’s right for you. A good place to start is by knowing what kind of customer you are. Do you hate the idea of commitment and want to avoid a contract tying you down? Or maybe you’re a bargain hunter who just wants the cheapest Internet with the highest value. One thing to remember is that value for money is always a better way for assessing how valuable a product is than pure cost. With that in mind, make sure you are looking at a product with great service and features at a price you think it reasonable – rather than the cheapest. It became clear in our survey results that all of the broadband providers offer something similar. What differentiates them is the value for money. As for value, most of our surveyed broadband providers achieved high scores. Dodo – Dodo is an Australian ISP owned by the M2 Group, an Australian conglomerate. Dodo offers services from a $19.90, 5GB per month unbundled plan to an $89.90, unlimited download plan. All of their plans operate at ADSL2+ speeds and are available on 24 month, 12 month and no fixed-term contacts. You can check 73 survey respondent comments from Dodo customers here. iiNet – With over 1.3 million customers, iiNet is the second largest Internet Service Provider in Australia. Specialising in ADSL2+ broadband plans (including bundled); you can choose from their range of 100GB to 1000GB data plans. Prices range from $29.95 to $109.95. Plans bundled with a phone line are generally cheaper. See 217 of the comments from iiNet customers. Internode – In 2011 Internode was acquired by iiNet and continues to operate as a separate entity. Internode offers a range of broadband options (bundled and standalone) ranging from 100GB a month to 1.2TB a month. Depending on the service chosen, prices range from $59.95 to $119.95. What 73 survey respondents say about Internode Broadband. iPrimus – Formerly known as Primus Telecom, iPrimus is a major Australian telco company offering ADSL, ADSL2+, Naked DSL and 3G mobile broadband. Their ADSL2+ Starter Bundle starts at $59.90 a month. Read what 63 of the iPrimus customers said about the plans and service. Optus – Since 1999, Optus has been offering broadband services to Australian consumers and businesses. Their partnership with Netflix means you have access to a free Netflix subscription with some of their higher costing plans. Check out what 405 of our survey respondents say about Optus broadband. Telstra Bigpond – Telstra is the first and biggest telecommunications company in Australia. Since 1996, Telstra has dominated the broadband market with the company’s market share reaching approximately 42% in March 2015. Read what 761 Telstra BigPond consumers had to say about the service and plans. TPG – TPG (which stands for Total Peripherals Group) started out as a computer hardware store. Now, the company offers nationwide ADSL2+, NBN, Fibre Optic and Ethernet broadband access. You can get plans ranging from 50GB for $29.99 per month to unlimited data for $49.95 per month. Read more from 194 survey respondents who have used TPG Broadband. Westnet – Westnet was acquired by iiNet in 2008. Offering both ADSL2+ and ASL1, you can choose between several broadband plans ranging from $29.95 to $109.95 depending on speed, data allowance and whether your property is within the Westnet network. Find out what 33 survey respondents had to say about Westnet Broadband. All ratings based off the table found here.